Chantry Flats to Mt. Wilson via the Winter Creek. Looking off a steep piece of granite from a ledge along the way. Here’s another way to do Chantry Flats to Mt Wilson. X-country via the Winter Creek Canyon is a seldom trod route. You see, I’ve got this habit which will seem quite normal to some and quite unconventional to most. I like to follow stream beds, canyon bottoms, in an upwards sort of way. Never down canyon, oh no, just up – which seems to be a less clumsy way for me to do these things. This way of hiking without the aid of trails or footpaths is often described as traveling x-country through the mountains. It’s very leveling and calming for my mind. Carefully stepping and watching for every detail makes me slow way down and find myself present to the world around me. Some of my favorite x-country haunts are places like Bear Creek and Devils Canyon in the San Gabriel Wilderness. The following describes a jaunt that I took four years ago from our little cabin at Fern Lodge to Mt. Wilson and back. I have just gone through and updated this blog today on 10/17/2016. A significant chunk of the day was spent traveling x-country up the Winter Creek to its’ farthest reaches. These are my notes. I said goodbye to my wife and left our little cabin at 10:20 a.m. on a warm summer morning this last Sunday. Motes of light filled with the talc-like dust from hikers boots filled the air along the Gabrielino Trail to Roberts’ Camp. From there my route followed the Lower Winter Creek Trail up past Hoegees Trail Camp. Eventually, I got onto the trail that leads on to Manzanita Ridge and Sierra Madre. Just near cabins 137-139 was where I cut down to the stream and then climbed up and over the last check dam in the Winter Creek. I followed a precarious game trail along a loose, crumbly and nearly vertical slope to get around this man-made obstacle. Looking up the Winter Creek stream bed about half-way between Hoegees and Mt. Wilson’s summit. This x-country route is basically non-technical, yet challenging on some of the steeper, narrower pitches. Walking on older fallen logs (Big Cone Spruce) is a good way to make your way up the Winter Creek stream bed. Notice the moisture found here even in the month of August. A smallish dry waterfall along the route to Mt. Wilson in the bottom of the deep and steep Winter Creek. I was able to climb up and over this choke point without too much challenge, with the exception of a lot of upper body workout! I passed a mountain lion track in a pocket of damp sand. Broke through occasional thickets of alder and willow, while lizards flitted about on the speckled boulders and polished cliff surfaces. I finally passed my last forlorn pocket of seedy dampness. The standing water too shallow for my backpacking filter intake to take advantage of. Yellow jackets covered every bit of muddy dampness they could. The wing beat of seemingly hundreds of flying insects filled the hot, still air. There were no flat spots to pitch my little one man tent and I was now working on my last liter of water. Onward I climbed on pitches of loose soils and crumbling bedrock. The view back down the canyon was startling. My route was as steep as a ladder, yet without good rungs. An antique cable of braided wire that I had been following for some time became my line to hold onto for some of the steepest, loosest slopes. Broken glass, ceramic insulator fragments and sections of rusted steel frame work, even water pipes, made their appearance as I approached the summit. Man’s trash always goes way downhill. A view back down the Upper Winter Creek from a peaceful, grassy ledge. Photo taken in the shade of Mt. Harvard while heading toward Mt. Wilson. Finally, I reached the top of the mountain at an old building that used to house some kind of electrical switching gear. There were hundreds of pieces of welding rod laying about the place. Soon I wandered into a sadly neglected house with its’ door swung wide open, just as it had appeared earlier on in the summer when I was last up on the mountain poking around. Wandering into the fly infested kitchen I said out loud, “Honey, I’m home!” Just silence, punctuated by the swarming of flies and golden streams of light angled down into the rooms. A sadness began to flow through me as I fell deeper into a tired funk. I’ve gotta get out of here and get some much needed water. Wandering over to the Larry Cotter memorial drinking fountain, I plop down on the adjacent picnic table. It’s hard to get enough water into this tired, middle-aged body of mine. I even drink down an apple juice in record time and then onto more water. About six liters have been absorbed, most of it leaving my body in the form of profuse sweat and breath. I’ve barely peed all day, and when I do, it’s dark yellow and not a whole lot, either. The day is still so hot and muggy, even at 5,700′ up. Since I’m now safely out of the grasp of the Winter Creek, why even camp out now? I ponder sleeping out on top of my down sleeping bag, eating a P&J sandwich (my third) and swatting mosquitos and no-see-ums all night long on some dry ridge top. The hell with that! I’m heading back to the bliss of Joanie and the cabin – Yeah! 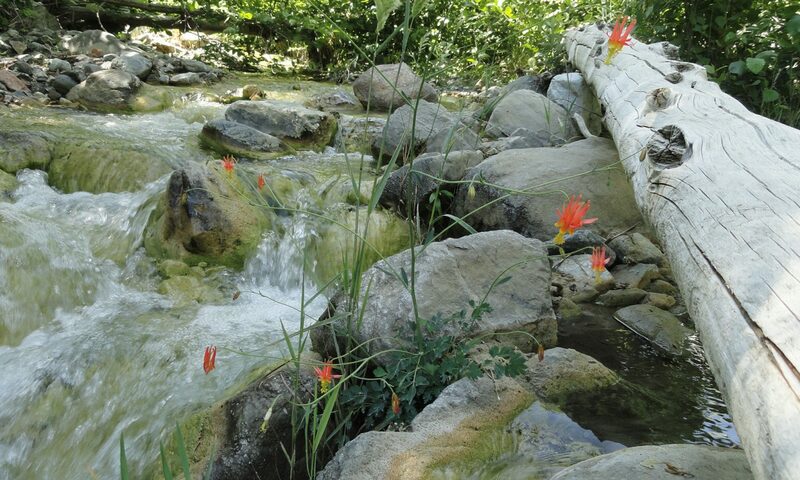 A cheerful cluster of California fuscia in the stream bed of the Winter Creek’s main fork. We are now very close to Mt. Wilson’s summit. Looking across the upper Winter Creek from the Mt. Wilson Toll Road on my return back to our family cabin in the Big Santa Anita Canyon. That steep, wooded draw that you can see in Mt. Wilson’s cliff face is the route I took at the very end of the x-country adventure. Looking here at Mt. Wilson’s broad ridge top summit on the horizon, the historic astronomer’s “monastery” is near the tip to the right of the draw. Mt. Wilson’s 60″ and 100″ reflector telescopes are off to the left of the draw. Eventually I drop down and down off the mountain to the David F. Drinkle memorial bench on Manzanita Ridge. Our friend Bohdan built that bench years ago and did a beautiful job on it. It is solid and lasting. I’m going to sit down on it as red ants swarm in their feverish way across the sun-baked sterile earth around me. I make up some instant coffee with cold water in a tin cup, eat another tangerine, part of a P&J, cheese,nuts and soon I’m down the trail to the cabin in the gathering dusk. In a bit of a happier, lighter way, I make up lyrics and sing songs that start me laughing. I come up with the craziest lyrics and feel a bit drunk from the summer sun beating down on me earlier. My voice spooks up a bear that crashes off the side of the mountain through thickets of God knows what. At 9:20 p.m. I return home to Joanie in candle light. She looks really clean! Or I look… I have a delicious tossed salad and wash it down with a high ball on the rocks. My day begins to blur and I’m serenaded to sleep within minutes to the chorus of crickets. A great day in the upper Winter Creek!